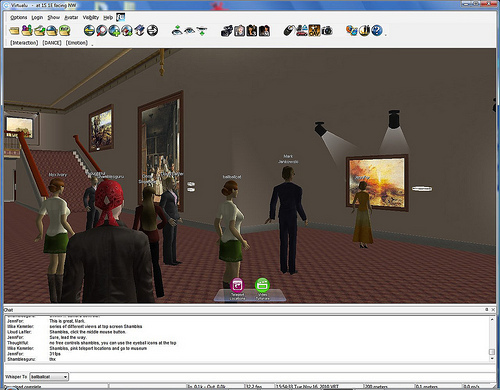 In a Strange Land: Empirical Evidence For Benefits of 3D Immersive Learning? Empirical Evidence For Benefits of 3D Immersive Learning? My contributor's copy of Teaching and Learning in 3D Immersive Worlds recently landed in my mail box. I look forward to reading the anthology this summer, but I paged ahead with a quest in mind: to find studies that provide empirical evidence that virtual worlds improve learning, when compared to similar tasks done in traditional settings. For at least three Singaporean youngsters struggling to master Mandarin, the answer was "quite an improvement." In a 100-point assessments at the start and end of the academic year, these students' "scores improved by 20-30 points compared to peers who, on average, improved by 9 points." The account appears in Chapter 12, "Learning Language Through Immersive Story Telling in a 3D Virtual Environment." The authors, Shen-Chee Tan and Yin-Mei Wong of Nanyang Technological University, admit that theirs is an "exploratory study" that could be repeated easily. They employed the ActiveWorlds virtual-world platform to create a virtual environment called "The Kingdoms," simulating a turbulent period in Chinese history "comparable to the tales of King Arthur" that "provides a context for introducing Chinese cultural artifacts and a storyline that is engaging." A much larger study would be needed to falsify or corroborate these findings, but such small pilot projects are a start to test the efficacy of virtual worlds for learning in many disciplines. We will see more and larger studies as time goes on.